Bake a sheet cake the size that you need. 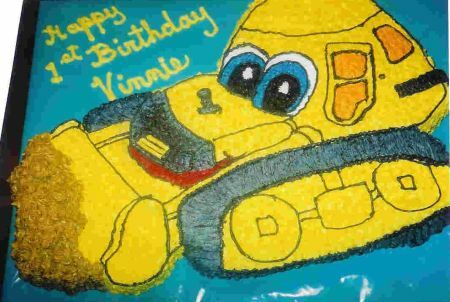 With an icing filled bag and round tip, size #5, draw a bulldozer on the cake top. You will use star tip, size #18 to fill in all areas of the cake and round tip, size #5 to do all of the outline work on the cake. First, with gray icing, fill in the gray areas of the cake. With red icing, fill in the mouth area right below the hood of the bulldozer. Next, using first white icing, then blue icing and finally black icing, fill in the eyes of the bulldozer. Use white icing to place a dot on the black part of the pupils in the eyes. The door and window of the bulldozer are filled in with an orange colored icing. With black icing, fill in the bar below the window on the bulldozer. Using a medium brown colored icing fill in the dirt at the front of the bulldozer. Using a yellow colored icing, cover the rest of the cake. Finally, use your black icing and round tip, size #5 and outline the entire bulldozer. Refer to the picture for reference of the entire outline. There are many other boys birthday cakes on this site. Just click the link below to return to Kids Birthday Cakes or click the button on the left to see them. This is a cute cake to make for a construction themed birthday party. It adds a little cuteness by having the bulldozer be a cartoon character rather than just a plain yellow bulldozer. There are lots of other cute construction themed cakes on this site as well. Some are bulldozers and other are construction site scenes. Browse below to see more!